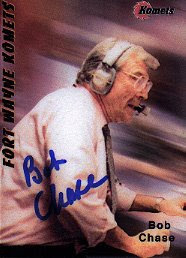 Recently, my friend in Ft Wayne Indiana, sent me this great addition to my collection, an autographed Bob Chase hockey card. Bob Chase was born in Negaunee, Michigan January 22, 1926. He was raised in Marquette, Michigan and after high school joined the United States Navy. Bob served in the Navy from 1943-1947. Upon his discharge from the Navy, Bob entered Northern Michigan University at Marquette and graduated in 1952. While in college, Bob started his radio career in Marquette in 1949. Bob moved to Fort Wayne to begin his radio career with WOWO AM 1190 in 1953 which included broadcasting Komet Hockey games starting with the 1953-54 season. Bob has not missed a season for 54 years since. Join Bob Chase in his 55th consecutive season, calling exciting Ft Wayne Komet action radio rinkside on WOWO 1190 and Comcast KometCast! I have no idea if this is a record, but record or not, 55 consecutive years broadcasting games of a single team is pretty impressive in my books, and this autographed card will go right along with my other prized collectibles.